Deep inside the belly of Oktoberfest you’ll find a somewhat secret, hidden park of its own called the Oide Wiesn. The Oide Wiesn is a time warp where the rides, games, entertainment, and even the beer mugs are from a long-ago time. Here, in the only part of the Theresienwiese that requires an admission, is the Festzelt Tradition. The Oide Wiesn, and therefore the Festzelt Tradition, opened in 2010 to commemorate the 200th anniversary of Oktoberfest. It was intended as a fun way to enjoy the “original Oktoberfest” of yore but mostly as an excuse to wear top hats and monocles, we presume. It was supposed to be just a one-time thing (don’t they always say that?) but people loved it so much they decided to bring it back again and again. 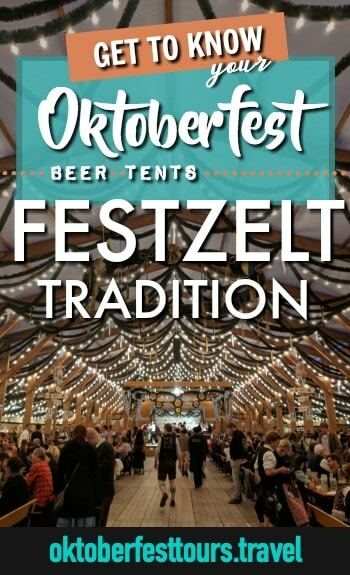 Today, the Festzelt Tradition (the largest of the three Oide Wiesn beer tents) is where to go for a “chiller” Oktoberfest experience. It’s where you go when you want to drink out of clay mugs filled from wooden barrels, when you want to perform traditional Bavarian dances on stage (yes, you’re totally allowed up there), when you want to be entertained by Bavarian brass bands and—get this—guys cracking whips to music. It’s really the most mesmerizing yet potentially dangerous thing ever. The Festzelt Tradition serves up Augustiner beer (the only brewery to still sell beer at Oktoberfest out of wooden barrels) in actually stein steins. ‘Stein’ is German for stone, maybe now it makes more sense. They also offer a huge menu’s worth of traditional Bavarian grub and even musical CDs featuring “Musik von der Oidn Wiesn”. It’s about to get cuhrazzzy up in here in 1810!